Stunning 3BR/2BA Brick Ranch in Cascade's Highly Sought After Green Acres Valley Neighborhood. 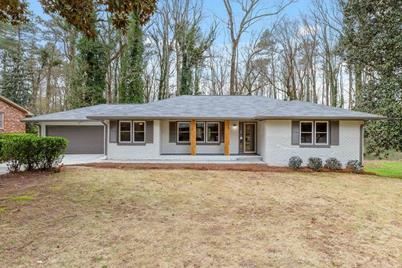 Built in 1960, This Meticulously Renovated Beauty Features An Open Floor Plan, New Roof, Stainless Steel Appliances, Granite Countertops, Hardwood Floors & A Unfinished Basement! Conveniently Located Inside The Perimeter Only Minutes From Interstates I-285 & I-20. Mangum Manor Is A Quiet, Well Established Neighborhood Nestled Close To The Beltline, Parks, Restaurants & Shopping. Don't Wait For The Weekend, See it Today Before it's Gone! Driving Directions: From Downtown Atlanta: I-20W to exit 51A. Keep right for GA-139. Right on Boulder Park Dr SW. Left on Brownlee Rd SW. Left on Benjamin E Mays Dr SW. Right onto Braemar Ave SW. Right onto Hazelwood Dr SW. Destination will be on left. 3400 Hazelwood Drive SW, Atlanta, GA 30311 (MLS# 6511112) is a Single Family property with 3 bedrooms and 2 full bathrooms. 3400 Hazelwood Drive SW is currently listed for $269,000 and was received on February 27, 2019. Want to learn more about 3400 Hazelwood Drive SW? Do you have questions about finding other Single Family real estate for sale in Atlanta? You can browse all Atlanta real estate or contact a Coldwell Banker agent to request more information.